I am going to try and post projects featuring the current In Colors. I made this card for one of my DH co-workers (yes, another one). I used the Kiwi Kiss, Baja Breeze, and Not Quite Navy card stock. The DSP is Urban Garden which will also be going bye bye soon. I used the lattice technique at the top of the card. (Visit Dawn's blog for video instructions.) 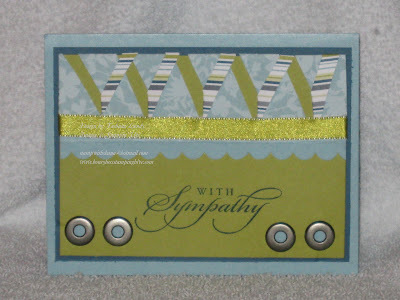 The Kiwi Kiss Satin Ribbon separates the DSP and the Scalloped edge. I added some Jumbo Eyelets and the sentiment is from Brighter Tomorrow(a retired stamp set).